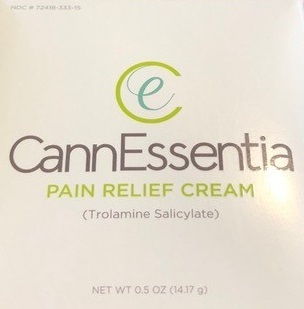 Proprietary Name: Cannessentia Pain Relief Cream What is the Proprietary Name? Non-Proprietary Name: Trolamine Salicylate What is the Non-Proprietary Name? Cannessentia Pain Relief Cream with NDC 72418-333 is a a human over the counter drug product labeled by Cannessentia Llc. The generic name of Cannessentia Pain Relief Cream is trolamine salicylate. The product's dosage form is cream and is administered via topical form. For external use onlyAllergy alert: If prone to allergic reaction from aspirin or salicylates, consult a doctor before use.